À PROPOS DE LA VILLA: 2 chambres, 2 salles de bain villa de deux étages avec une pellicule autour véranda situé directement sur la plage de Whitby avec sable blanc et eaux turquoises. LA VERANDA: Profitez de la surise du matin, les brises de l'après-midi, des cocktails en soirée, dîner dans l'air chaude des Caraïbes et observation des étoiles. l'enrouler autour de véranda pose la question, pourquoi même aller à l'intérieur? LES CHAMBRES: Deux chambres spacieuses à l'étage chacune avec lits queen size, de superbes vues et des brises merveilleuses. LES SALLES DE BAINS: Une salle de bain sur le levier supérieur avec douche carrelée de luxe; une autre avec douche à l'étage inférieur - grand accès facile pour l'utilisation de tout sur la plage ou après. LA CUISINE: Plafond voûté dans la cuisine entièrement équipée avec salle à manger séparée. LE SALON: Plafond voûté dans le divertissement / salon avec lecteur DVD / Blu-ray / CD avec mur de portes coulissantes en verre avec plage et l'océan vues panoramiques élevées. Whitby WH is quiet oasis right at the waters edge on a very low trafficked beach. There are only a handful of homes to the right and left of the house which has an ample lot with white sand. There are two hammocks in the shade for rest from the sun when you want it. 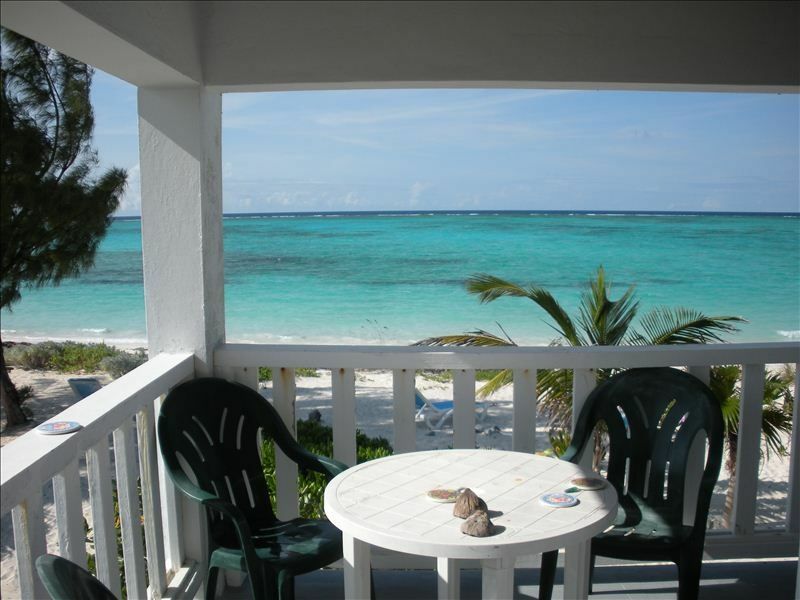 North Caicos is a secluded location and not for those who want nightlife and many restaurants. The airport can become hectic going in and out on a Saturday particularly if there are flight delays. We took a cab and paid our driver to stop for about 15 minutes at the IGA before heading to the dock to take the ferry to NC's. The ferry is about 30 minutes and a nice excursion. We knew groceries were limited on NC's. After a short ferry ride Mac was waiting at Sandy Point to us to the home. We picked up our rental car at the marina and followed Mac. Rental cars are recommended to enjoy places like Dragons Cay, the caves and beaches in Middle Caicos. We also went on day trip fishing and snorkeling with Captain D and had a great view of humpback whales for quite a while. The house is well cared for and fully equipped. The WiFi worked shockingly well despite the wind blowing onshore. The ocean is warm and we enjoyed swimming/floating during the day. The kitchen has all the pots/pans you will need and the home is well decorated. The veranda is a great place for morning coffee with the ocean breeze. The Silver Palm restaurant is down the beach just check with the owner (Karen) first to make dinner recommendations. If you are looking to decompress WWH is a great location. We loved our stay on the island of North Caicos and it's more beautiful than the pictures on the website. The house was so awesome, it had everything we needed for a relaxing vacation. We went snorkeling, fishing, sight seeing, walks on the beach day & night (please make sure you take the drive to Mary Cay's and Flamingo Pond) it's really beautiful. We went to the Silver Palm for (1) lunch and (1) dinner (make reservations for dinner) it was amazing and they sell homemade ice cream (so good). Mac the caretaker is wonderful, he stopped and checked in on us. We stopped at the IGA on the way to ferry to get all the food for the week. It was an amazing vacation. Thank you to Lynne & Brian!!!!! White House was perfect in every way. We had a wonderful experience during the booking process and experienced great customer service. When we arrived, the caretaker (Mac) was very helpful and wait for us in the pier...Mac was so nice and answered all of our questions throughout our stay! When we got there, he explained everything about the White House to us. The views were some of the best on the island. The entire property inside and out was just as described, but more beautiful in person. We really enjoyed our stay and it was hard to leave. The beach access was very private and easy to access. It also had all the necessities we needed to cook for the week.. The rental cannot be beaten for amenities or location. When we return it will be to White House! We CANNOT say this enough, we are more than happy with our stay. It made our New Year's eve, my birthday and experience we will never forget. Thank you Lynne and Brian for sharing your beautiful house! Privacy, Relaxation, Getting away from the crazy world. We have been too many different locations. All on the water. This one was every bit as wonderful, beautiful, and secluded as we hoped. Seems That there is always pros and cons to every place. I will give my list of each, but in the end its still 5 star. Pros: Water is as clear and blue as you could ever want. House was clean, had pretty much all you could need to feel as though you were in your own home, property was beautifully laid out (not over grown with vegetation as some other properties area). Beach was great for walking. In one direction (about .70 miles down) you had to walk in the water to get around an out cropping of lava rock, and then you can go for miles. I enjoyed walking in that kind of clear water. In the other direction (about 1.30miles down) there is another walkable rocky area and then miles and miles of beach walking. Both are great meditating reflection walking areas. For us the last chances restaurant was our pick. It was more expensive than the others, but having our chef (Howard) greet us out front and then just hanging out with us chatting about his life and the island made us feel like we were in his home. My dees was another good place. As other reviews have said. there is very few people that you see on the beach or anywhere for that matter. couple of walkers during the day but most times you don't see anyone. Middle Caicos beaches were beautiful, and the drive there was fun interesting and not very far. The Whitby white house is a perfect place to get away from it all.If you want to find peace and serenity this is a place for you. We walked the beach to Three Marys Cay and did not see 1 person. KJ's market has the essentials for your stay in case the restaurants are closed. More seashells than any beach we have been at. Even found a glass ball. Holiday rates are higher for Christmas and New Years periods. Please email for your holiday quote. Cancellation Policy: If we are able to rebook your cancelled dates, you will receive a refund for each of those rebooked days with no administrative charge. Otherwise, bookings are non-refundable. We suggest you investigate travel insurance options.